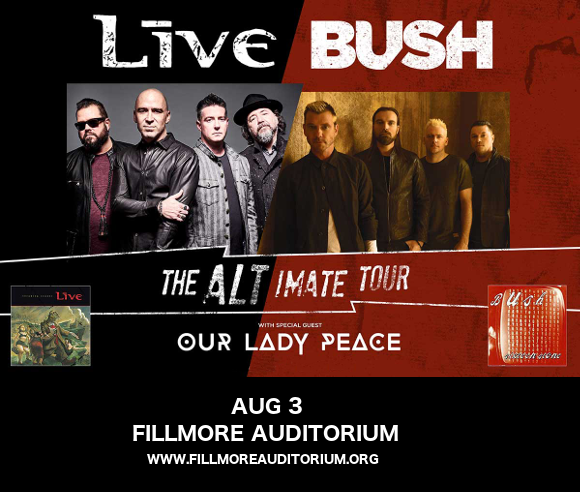 Alternative rock fans, are you hyped for Live and Bush?? Together with support from Our Lady Peace, these three bands are hitting the road in celebration of the 25th anniversary of the respective albums that helped to make each of their careers. They’re on their way to the Fillmore Auditorium on Saturday 3rd August 2019 – are you going to be there to celebrate with them?? There’s only one way to be sure!! Grab your tickets to Live and Bush today, while they last!! And they’re still hungry for more!! What about you – do you have your tickets yet?? If not, then hurry – they’re not expected to last for long! !